The Trifid Nebula is an extremely colorful combination of a reflection nebula and an emission nebula. The lower, reddish part of the nebula contains the emission nebula - hydrogren gas which is emitting red hydrogen light since it is being heated by the hot young stars within the nebula. 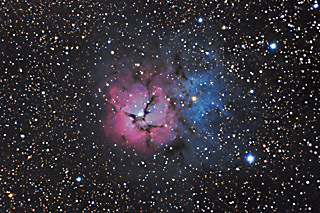 The upper blue portion of the Trifid is a reflection nebula - it consists of dust particles that are reflecting the light from the hot stars contained within the emission nebula. Because the hot stars are mostly blue, we see the reflection nebula as having a blue hue. In this image, North is Up. This image is cropped to 75% of the original full frame. Software Used Images Plus 4.5 for camera control, calibration, stacking, digital development, multiresolution sharpening, smoothing and noise reduction. Photoshop CS5 used for levels and curves, color correction, high pass filter, star shrinking, lab color, saturation adjustments, screen mask invert, lens correction, match color, and smart sharpen. Gradient Xterminator for gradient removal. Carboni Tools for additional saturation adjustments, noise reduction, and smoothing. HLVG for additional color correction. Notes I am very satisfied with the final result on this image. It represents a nice improvement over last years image, and I like the final colors in the photo. 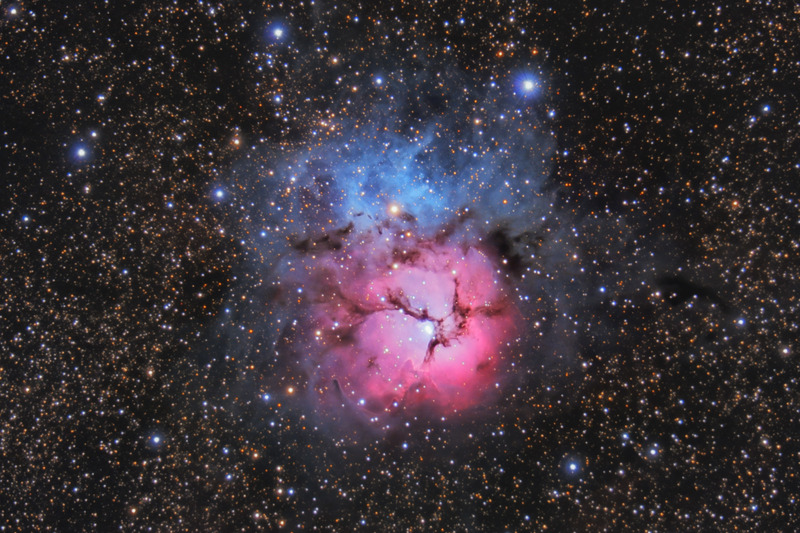 This image was published by Astronomy Magazine as its Picture of the Day for April 3, 2013. Its my seventh Astronomy Magazine Picture of the Day!